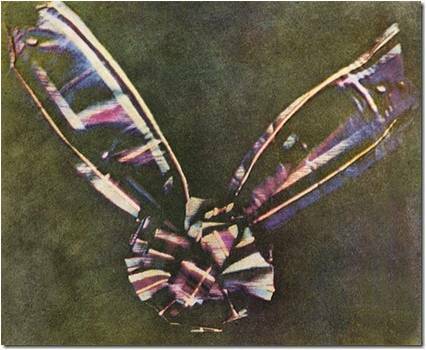 This picture is acknowledged to be the first color photograph ever made. Its inventor was testing his hypothesis that light itself could be broken down into different shades just like the colors in nature. He reproduced the same black and white image three times using pieces of colored glass, red, green, and blue, to filter the picture. The three images combined produced a successful color image. Dr. Maxwell was also interested in theories of physics, mathematics, and electromagnetics, and was one of the most important and innovative scientists of the 19th century.